22nd April, Barnsley: Jason Belmonte of Australia was crowned the new PartyPoker.net World Tenpin Masters Champion after defeating Paul Moor of England in a thrilling final at the Barnsley Metrodome. In the best match in the 10-year history of the competition, Belmonte threw a perfect 300 game and then followed it up with 266 to end on an incredible total of 566. Moor himself played superbly to register 524 but the Aussie produced a near-flawless performance to clinch the trophy. 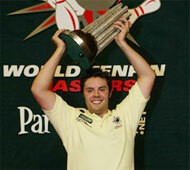 After three days of top quality bowling the final of the 2007 PartyPoker.net World Tenpin Masters was between Paul Moor of England and Jason Belmonte of Australia. Both players had played superbly to reach this stage as Moor defeated Biboy Rivera (Philippines), Alex Liew (Malaysia) and Remy Ong (Singapore), while Belmonte recorded successes against Jens Nickel (Germany), Badr Al-Sheikh (Saudi Arabia) and 2006 winner Chris Barnes (USA). There was a great deal at stake as the winner of this match would collect $30,000, compared to $10,000 that goes to the runner-up. Also up for grabs was the honour of being World Tenpin Masters champion and winning one of the most prestigious competitions in world tenpin bowling. As expected the match was of a top standard as both players recorded strikes with each of their first three balls. Moor and Belmonte maintained this standard through their next three as they had each recorded six successive strikes and both were halfway towards a perfect 300 game. The first error came in Moor's seventh frame as he hit the first spare of the match, to give Belmonte a chance to move ahead. He accepted this opportunity as he moved up to nine successive strikes and only three balls away from a 300. The tenth and 11th balls followed in the same fashion so he had an attempt at the perfect game. He was successful as the crowd went wild as Belmonte hit perfection. It became only the second 300 game in the history of the World Tenpin Masters, but, ironically, the first one was also made by Belmonte, in the 2005 competition. The second game began in exactly the same fashion with another six strikes - three for each player. But the turning point came in Moor's fourth and fifth frames as he registered two successive spares as the trophy looked to be heading to Belmonte. In an incredible performance, Belmonte hit a further three strikes for six in the second game and 18 out of 18 in total. However, the run had to come to an end and it did in Belmonte's seventh frame of the second game. It was also an open frame to give Moor hope of clinching a remarkable turnaround, although he had to overhaul a 40-pin difference. But Belmonte was too good and made no further mistakes as he hit 23 strikes out of a possible 24 to become the 2007 World Tenpin Masters Champion. We've got to feel sorry for Paul, though. Coming second for the second consecutive year was heart-breaking, especially as this is one tournament he has his heart on winning, a really elusive dream. 22nd April, Barnsley: The PartyPoker.net World Tenpin Masters final will be between Australia's Jason Belmonte and local hopeful, Paul Moor of England after the Aussie defeated Chris Barnes and the Englishman knocked out Remy Ong in the semifinals. 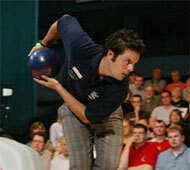 Jason Belmonte believed his victory over Chris Barnes was the hardest match of his life. Belmonte registered a 523-490 success against Barnes, an aggregate score that was the highest total ever in the ten-year history of the World Tenpin Masters. "I'm physically and emotionally drained," said Belmonte. "He just would not stop hitting the pocket. I've to be honest and I got lucky. Chris left some pins when he should not have done but that's how bowling goes - plenty of times they have stood for me. "This is my third time here and I just want to come and bowl well but to make the final - I'm speechless. It's a really cool thing and not many people can say I've been in a final of the World Tenpin Masters. It doesn't matter who I play. If I can beat Chris I can beat anyone." Barnes was quick to praise his opponent and then tipped Belmonte to win the final, which will be against either Paul Moor. "That was one of the best matches I've ever been involved in," said Barnes. "He didn't have many lucky strikes and a lot of perfect ones out there. If I had stayed close then it might've been interesting. I've been dodging bullets for a couple of years and one of them finally got me. "I've to give the night to Jason. he has bowled unbelievably. Even as dominating as Paul has bowled and as good as Remy has been, I think Jason is the favourite." In the other semifinal, Paul Moor of England sealed a spot in his third successive World Tenpin Masters final with a dramatic final ball victory against Remy Ong. 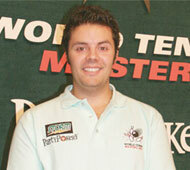 Moor won 472-471 to set up a final against Australian Jason Belmonte. After the first match, the score was 248-235 to Remy Ong but the fortunes changed around with the first ball of the second game as the Singaporean left a 6-8 split. Ong was confident of hitting them both but the ball narrowly missed the pins as the Englishman regained the lead. In a tight, tense encounter, Moor stayed in front as Ong could only manage three spares in the first six frames of the second game. But two spares from Moor saw Ong again get close and was only one pin behind. In a thrilling end Ong piled on the pressure by ending on a score of 471 and that meant Moor needed two strikes and a nine - spare to seal a win. Moor made the two strikes and then hit a nine for a make or break final ball of the match. The Englishman held his nerve to claim the spare and win by just one pin. 22nd April, Barnsley: Current Asian Ranked No. 1, Remy Ong of Singapore gave Asia hope after he defeated local, Dominic Barret in the quarterfinals to reach the semifinals of the PartyPoker.net World Tenpin Masters. A very intriguing match-up with top Asian Remy Ong and local player Dominic Barrett. Remy put out three-time world Tenpin Masters' champion Tore Torgersen and this talented lefty now has another notch in his belt as he makes his way into the semifinals to face the feared Paul Moor. A 225 tie saw neither with an advantage going into the second game, but an opeing four-bagger from the Singaporean put real pressure on the Englishman. Huge changes in the lane condition made matters even worse and after being 45 pins down in the third frame he switched bowling balls. That change brought him back into contention with four straight strikes but a stubborn 10-pin in the tenth frame robbed him of a chance to catch Remy. It will be a case of 'standing room only' at the Metrodome in Barnsley tonight as the support for this event is unequalled. Bader Al-Sheikh from the Kingdom of Saudi Arabia would certainly be a willing pupil at any scheduled seminar at which the popular kegler from 'down under' will hold, especially on coping with ever-changing lane conditions. All went well for the slim Saudi Arabian in the first game, that is until a big split in the seventh frame. But his big failure was to leave one pin standing from the 3-6-10 in the tenth frame. Now very much the underdog, Al-Sheikh had an impossible task to catch 'Belmo' and the Aussie with the unique two-handed delivery marched on to the semifinals later this evening, meeting defending champion Chris Barnes of the United States. The encounter of the lefty kind. Both left-handers and both bowling along the same line, so the lane changes would be variable and vital. Paul figured them out much quicker than Alex and the Malaysian really had to go fishing in the second game. Unfortunately, he didn't get any bites and Paul's errors left just single pins. Alex, the birthday boy, is really disappointed at not reaching at least the semifinals, where he lost to Chris Barnes last year. This prestigious event now looks very much having a repeat of last year's final of Paul versus Chris Barnes. 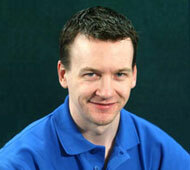 In that showpiece, Paul was leading going into the final frames and lost because of a big split in the eighth frame. He'll be very careful not to do that this time, if that attractive match comes about. Story and photos courtesy of Keith Hale, Bowlers' Journal International. 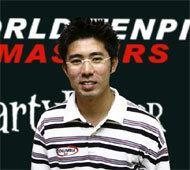 21st April, Barnsley: Three Asians, Alex Liew of Malaysia, debutants Badr Al-Sheikh of Saudi Arabia and Remy Ong of Singapore, made it to the quarterfinals of the PartyPoker.net World Tenpin Masters 2007 on Day 1 at Barnsley Metrodome. Like the proverbial lily on the pond, this world Tenpin Masters just gets bigger and better every year. This afternoon's opening match had the crowded Barnsley Metrodome audience on the edge of their seats as this match literally went pin for pin right through to the final frames. Al-Sheikh carried just one pin forward to the second game and they both fought tooth and nail for victory. Blood, toil, tears and sweat had nothing on what they both felt as they came into the final frames and a stubborn 10-pin in the ninth frame was the undoing of Cundy. So. Al-Sheikh progressed to the quarterfinals to come up against Aussie Jason Belmonte. Alex Liew can now officially be called the 'Comeback Kid'. Forty-one pins down in the sixth frame of the first game, he managed to out four strikes together to bring the deficit down to eight pins. Surprisingly, the burly Canadian went seven frames without a strike whilst the lithe Malaysian leftie buried each shot in the 1-2 pocket, leaving just two 7-pins and came out of the fray with a handsome lead of seventy pins overall. Maybe they were dancing in the streets in Kuala Lumpur tonight, but there will certainly be some smiling faces at the Pyramid MegaLanes in Petaling Jaya. Michael's father and coach, Uhlrich, was as surprised as his young son at the string of nine-spares. "It's so frustrating when you bury the ball in the pocket and don't carry all the pins," he exclaimed. Biboy rivera is another candidate for entry into the 'Comeback Kid Club' but his entry has been black balled by Paul Moor as he put together a superb 289, the highest game of the tournament so far. 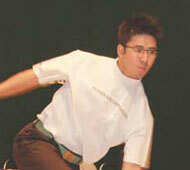 Rivera, the 2006 WTBA Men's World Championship Masters' titlist, suffered the having just one strike in his first game and emerged from that confrontation with a huge deficit to the striking Englishman with the strange nickname of 'The Persuader'. "He should move further right on the approach," said Jason Belmonte as an enlightening co-commentator to the cool, calm and collected Simon Golding. Rivera probably did just that as he managed to string quite a lot of strikes in the second game but made no headway against Moor and now heads home, understandably a little dejected. A little bit sad that the person who has thrice topped the podium has gone out in the first round. Not to take anything away from Remy Ong's performance, though. The Singaporean strung six strikes in the first game and that more or less sealed the match. New father Torgersen has not been hitting the limelight recently but still has great tenpin talents. Unfortunately, splits in the first and second games robbed him of vital pins. But Torgersen will be back and currently Ong marches on to the quarterfinals. talented Mrs Asbaty didn't think that way and a couple of nine-spares robbed her of a place in the quarter final. It was strange that Barrett lost his momentum with the change to the second game but he did admirably to hold up under the pressure of the American superstar. Nurse - the screens! We're all shuddering, nervous wrecks after the six intense matches on the program today and none were more nail-biting than the fight for the semi-finals between Barnes and Palermaa. A 4-6 split in the tenth frame by Barnes brought the scores closer and a 2-8-10 in the eighth frame of the final game robbed the gallant Finn of any chance of victory. Both bowlers were incredible in their accuracy, ball after ball solid in the pocket, especially from the tall American who had just that one errant shot. Believe it or not, but the pace could get even hotter tomorrow when the other three quarterfinal matches are contested, opening with Jason Belmonte against Bader Al-Sheikh, then Alex Liew takes on Paul Moor before the finish of the afternoon's schedule with Remy Ong versus Dominic Barrett. All good stuff! 20th April, Barnsley: PBA star and defending champion, Chris Barnes display masterclass skills to cruise into the quarterfinals of the PartyPoker.net World Tenpin Masters 2007 after defeating Zara Glover of England, 524-416 in the Round 1 knockout matches. What a masterclass on the skills of tenpin for Chris Barnes and such a load of sympathy for Zara Glover for having to withstand such an onslaught. The PBA star had nine strikes in a row from the seventh frame of the first game through to the third of the second, then struck out for a 279 and an overall average over the two games of 262. Nice work if you can get it and a shudder of horror for the rest of the field yet to compete in this fantastic tenth running of the World Tenpin Masters, sponsored once again by PartyPoker.net. "I didn't think that I would score that well," commented Barnes after the match. "I had a slow start but the lanes got slicker and I really got locked in." Zara Glover was understandably not too happy to go out in the first round for the fourth time. "I chose the wrong ball to start the first game," she said. "Things improved when I changed equipment but there was no way I was going to catch Chris." Guy Caminsky faced something like a massacre as Osku Palermaa hit 13 strikes in a row, but it all changed as the South African changed bowling balls in the fourth frame of the second game and hit seven straight strikes to come home with a respectable score, albeit still 26 sticks adrift of the lithe two-handed Finn. "Bowling in this atmosphere is not a lot more different to many of the finals I've bowled in," said Palermaa. "I was pretty well relaxed and was confident throughout the match." Usually when you come up against injured players you tread very warily as the results can be very much against the grain. But that was not the case for the Australia versus Germany finale for Friday evening as Jens Nickel is really suffering from an injured knee and was unable to complete his usual smoot slide and delivery on the approach. In fact, after the first few frames it began to look as though he might not be able to complete the two games. Having to stomp on his last step, Nickel was not able to get the rotation on his ball and was far from his usual accuracy. into the game with strings of strikes and would have won the last game but for an open frame. But he was still 58 pins short of Belmo's outstanding 494.